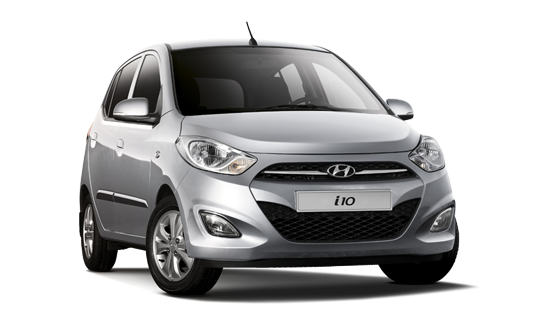 Hyundai i10 | HYUNDAI - NEW THINKING. NEW POSSIBILITIES. 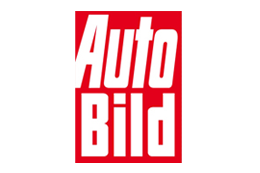 Ranked second among compact cars in Europe by "Autobild"
The i10 was ranked second among 6 major compact cars sold in Europe by "Autobild", Germany's most popular auto magazine. 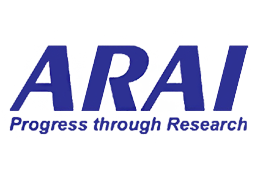 The i10 was certified to have the highest gas mileage of 19.81km by the Automotive Research Association of India (ARAI) in the compact segment. But it is also practical. New clear headlights The newly designed clear headlight clusters not only look good, they improve both your night vision and your on-road visibility, adding elegant extra safety. Exterior mirror indicator repeaters Extra style with extra safety. These repeaters make your intention to turn clear, even if other road users cannot see the front or rear lights. Elegantly integrated into the rear bumper, the rear reflector alerts other night time road users to where you are parked. 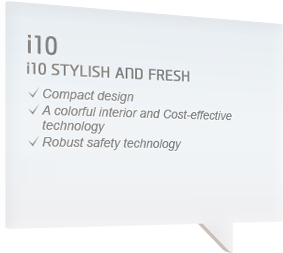 Great radio reception from a small, aerodynamic antenna that fits exactly to the style of the i10. Sunshine, good times and fresh air, the glass, tilting sunroof fits perfectly to good weather driving enjoyment. Sporty 7-spoke style with 165/60 R14 tires add a touch more personal style. Stylish double spoke covers add attraction, supplied with155/70 R13 tires. Electric heated exterior mirrors make life safer in bad weather conditions. For extra elegance they are available in body colour. Red, Blue and Black smart colours, clever choices The black dash looks elegant and feels good as does the black, contrast stitched, base trim of the seats and the doors. Finally, if you love the classic look and feel of leather, but don’t want animals killed to provide it, black and beige leather-look interiors are available. The i10 has three engines to choose from, A 1.1â„“ with 69ps and the 1.25â„“ with 85ps. Constantly Variable Valve Technology (CVVT), which measures every drop of fuel for maximum efficiency, is standard on the 1.25. Both guarantee maximum fu with minimum thirst on the road. Transmission Precise 5-speed manual or convenient, efficient 4-speed automatic transmissions fit the i10 exactly to your driving style. Both are available with the 1.25â„“ engine. With either, simply by checking the trip odometer you’ll see immediately how efficiently they minimize consumption while increasing the pleasure you get from driving your i10. Intuitive fingertip control of the audio system, via steering wheel remote controls is available for extra comfort, convenience and safety. 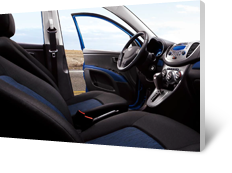 Designed especially for the i10, this stylish integrated stereo system has four speakers and guarantees a good sound. Remote control central locking key that protects your pockets and conveniently unlocks the doors for speedier access. Conveniently placed storage bin to care for smaller items and a 12v outlet for the personal electronics of the front seat occupants.